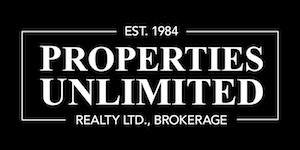 Properties Unlimited Ltd was established in 1984 and is 100% Family owned and operated and 100% Canadian. The LeBlanc Family has been helping clients since 1976. Properties Unlimited is a neighbourhood brokerage located in Leaside (Laird and Eglinton) that grew over the years to service not only our local neighbourhood, but the greater Toronto, Ontario area, and parts of southern Ontario, as well. We offer Real Estate services across Ontario Residential, Commercial, Condos and Investments. Centrally located, with easy access to all major highways and routes throughout the city. Our Real Estate Sales Representatives and Real Estate Brokers have many years of experience in many different areas of real estate and are ready to help you with all your needs. We are dedicated to selling your property or finding you that dream property you are searching for. You are invited to browse our website and call or e-mail us with any questions you have about buying or selling a property in any area you have an interest in. We are Knowledgeable and Trusted to service your needs in Toronto, the Greater Toronto Area and throughout Ontario. Our Referral Service and Relocation Services are available in areas, North of the GTA , outside the Ontario area, across Canada, the U.S.A., Europe and many other Countries of interest. Your satisfaction is our top priority! We will take the time to listen to your needs and desires and help you find your dream property. We will get your property sold for top dollar and in a timely manner. Our online and offline marketing programs give us the edge needed to make this possible! Need consultation on Resident or Commercial projects. We can help. Just thinking about a move, but not sure. We provide "no obligation" consultation to help you every step of the way.